Inscribed: Northcote/Visitor/at the Royal Academy/Somerset House; a drawing of a Roman soldier on verso. 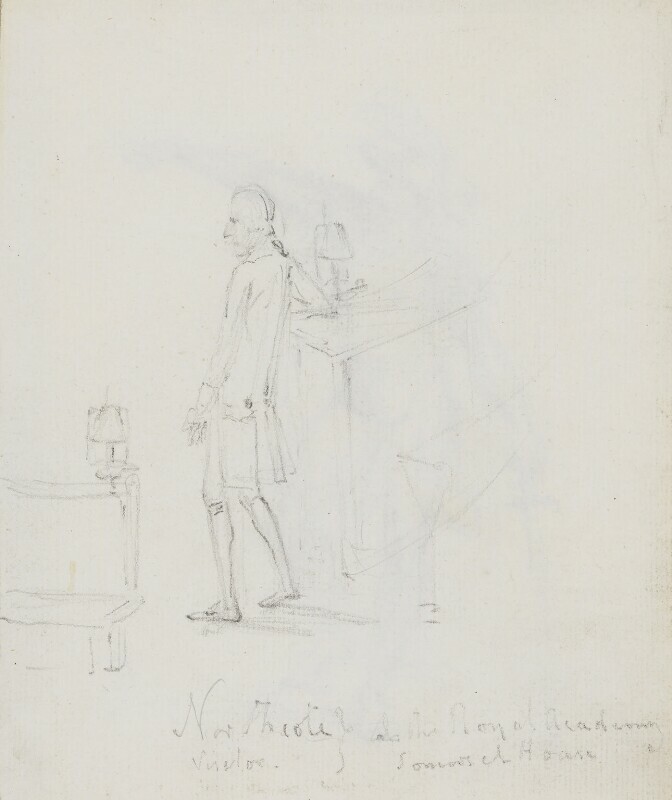 Northcote stands between the RA desks in Somerset House before the removal to Trafalgar Square in 1837. He is elegantly dressed but even so somewhat recalls Leslie's description, 'his diminutive figure was enveloped in a chintz dressing-gown, below which his trowsers, which looked as if made for a much taller man, hung in loose folds over an immense pair of shoes into which his legs seemed to have shrunk down' (Recollections, p 68). Shepheard, mainly a romantic landscape artist, exhibited RA 1811-42. Given by Iolo Williams 1961.